After spending the time to find just the right diamond engagement ring that perfectly suits your style and your life, it can be a big disappointment to not be able to wear it right away because of an inaccurate ring size. To eliminate the chances that you’ll have to send your ring off to be re-sized after receiving it, it’s a good idea to familiarize yourself with the basics of determining your ring size, as well as the importance of a proper fit. Although elements such as cut, color, clarity, and carat weight are integral to ensuring a sound diamond investment, the size of an engagement ring is also an important consideration. If the ring is even just a little bit too small, it will cause discomfort or even pain and may be very difficult to remove. On the other hand, if there’s too much room between the finger and the ring, you run the risk of the ring slipping off and getting lost. It is important to remember that your diamond engagement ring is a permanent piece of jewelry you’ll most likely wear every day for the rest of your life; determining a proper ring size is essential to ensuring the comfort and security of your certified diamond. According to commercial jewelers, the most popular engagement ring size ordered by today’s American couples is a 6, although there are wide variances. Most jewelers will have a tool you can use to measure the size of your finger. Sizes are obtained by measuring the inside of the ring using a numeric scale based on quarters and half units. The sizes of your two ring fingers may differ by up to half a size, with your dominant hand usually a bit larger. For most accurate results, obtain the measurements as late in the day as possible. The fingers tend to swell later in the day, so a size obtained early in the morning will likely become too tight as the day progresses. You may also want to record a week’s or month’s worth of measurements to track the fluctuations. The size of your fingers can change according to a variety of factors, including temperature, illness, medications, fluctuations in weight, or degree of exercise. Foreign countries use different standards of ring measurement than the United States. An international ring size conversion chart is available for your convenience. The size of a ring may be affected by its diameter. As a general rule, wider bands require larger sizes than smaller ones. A ring’s style may also have an affect on the size. At Brilliance, we offer complimentary ring resizing services to all customers who have purchased a certified loose diamond or diamond engagement ring from us. Allow at least 7 business days after receipt of the ring for the resizing to be completed. We will return all re-sized rings back to you via secure UPS delivery. 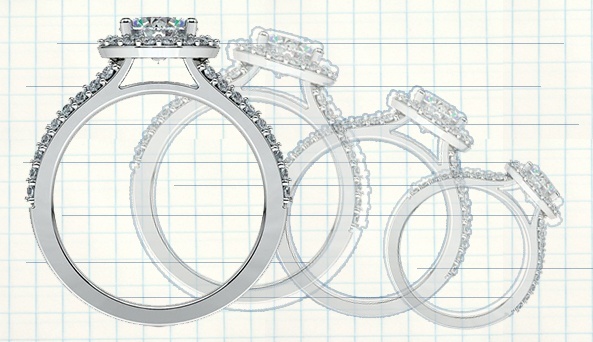 We also offer an online Ring Sizer at Brilliance that can be printed off and used to gauge an estimate of your proper ring size, or we can send you a free sizing tool to use at home. If you have any questions or requests pertaining to ring sizing, please contact one of our fine jewelry experts at 1-866-737-0754.